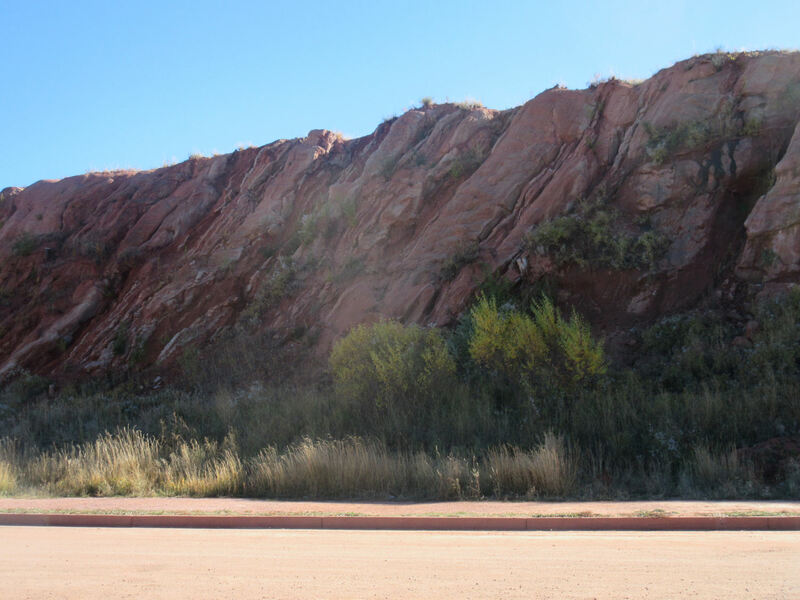 The Springs in Fall * 2015 Photos #9: Rollin’ ‘Round Red Rock « Midlife Crisis Crossover! If the sun tries to burn me, maybe this giant rock shaped like a crab claw will save me. 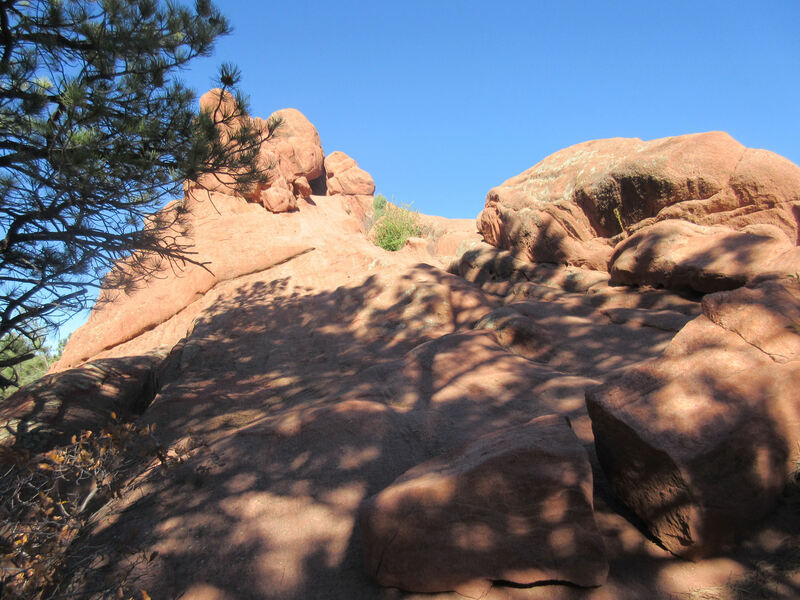 By the time I was finished wandering Woodland Park, I’d lost interest in continuing the snaky haul southwest through the Rockies to Cripple Creek, and decided to head back east toward Colorado Springs. I was tired of driving but, to my surprise, still in the mood for high-altitude walking. Despite my appearance, I’ve come to like the sensation of walking in and of itself, as long as the surroundings don’t bore me and especially if I can walk at my own speed. Years of discreetly running from class to class in both junior high and high school, followed by twelve years of restaurant work in which speed was essential to both service and survival, conditioned me for an above-average pace when left to my own devices. It’s rare that I really get to cut loose back home. If I do, my wife’s cute tiny legs struggle to keep up. I’ve never actually seen my son hurry, and my mom decided in her forties that she’s officially elderly, a few decades ahead of schedule. If I indulge myself, I leave my loved ones eating my dust. 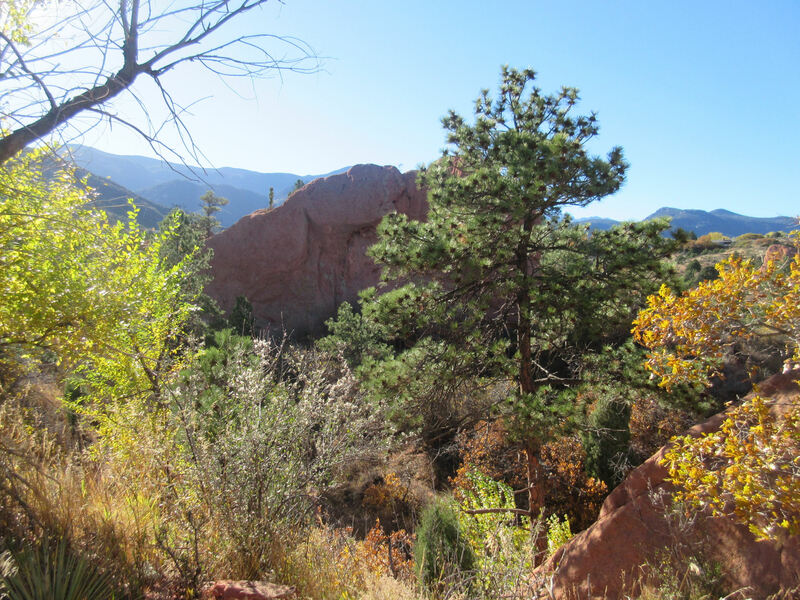 US 24 took me through Manitou Springs and to the perfect spot to push myself: Red Rock Canyon Open Space. 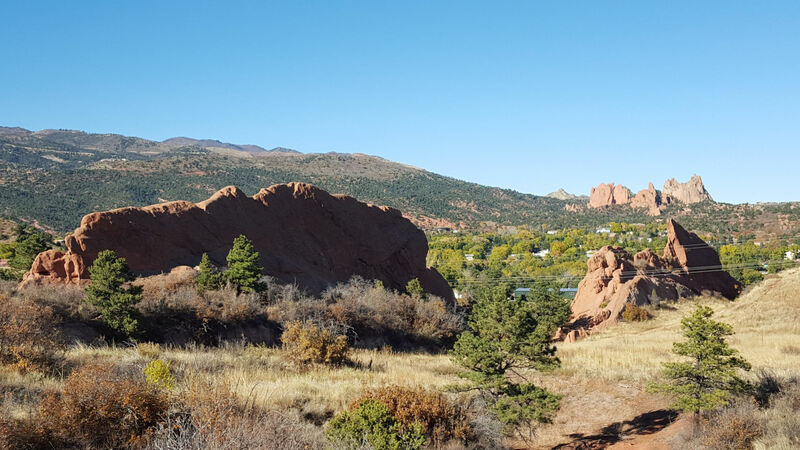 Curious natural sights, varied terrains, and the Rockies for a backdrop. Much more stimulating than the average treadmill grind. You arrive in the parking lot, you’re not even out of the car yet, and already you’re facing a miniature mountain range. Once upon a time in previous centuries, this giant patch of land was ugly and colonized and covered by unsightly industrial concerns — a mill, a quarry, some pits, even a landfill. 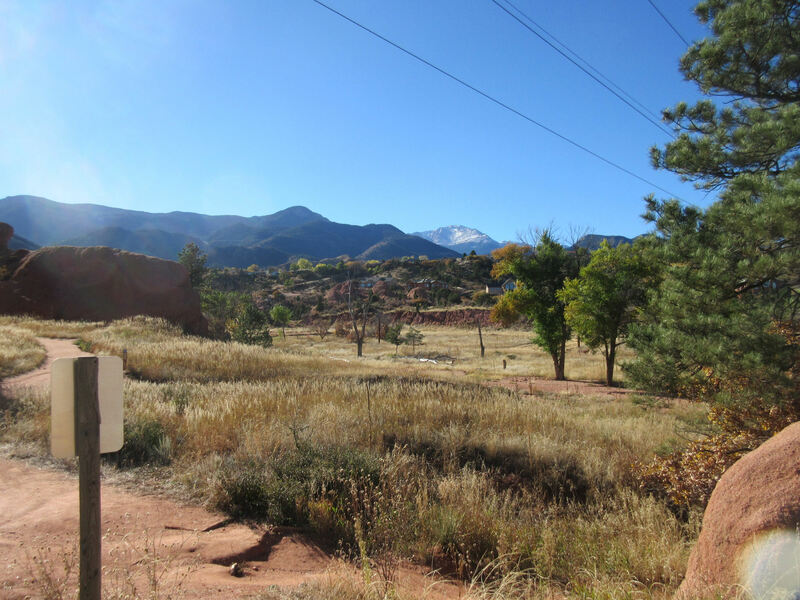 After a series of purchasing, reclamation and refurbishing efforts over time, the City of Colorado Springs took over in 2003 and now the whole area is one big city park. 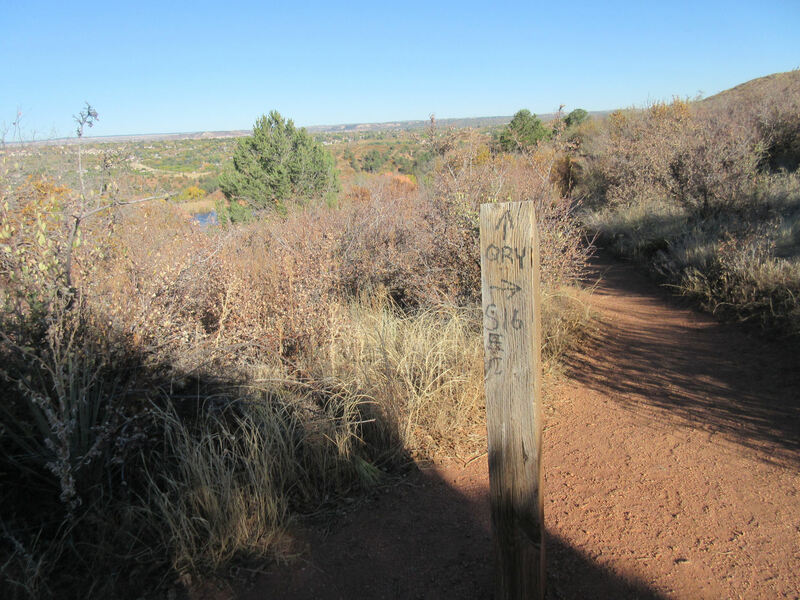 Some parts deemed unfit for recreation are still off limits (quarries don’t upconvert easily), but dozens of miles of trails crisscross its nearly 1500 acres (recently expanded from nearly 800). Sample mild trail takes you near sample red rock. 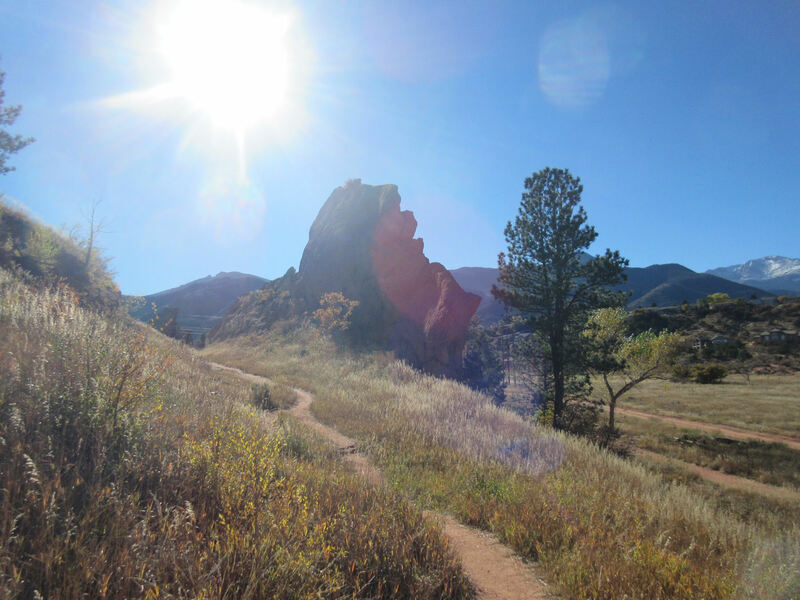 I parked at the south end of the park, grabbed a new bottled water from our Estes Park stash in the trunk, and spent quality time traipsing around at whatever speed I felt like, taking in all the flora and the geology and such, and saying hi to a few other nice folks taking their own afternoon strolls. 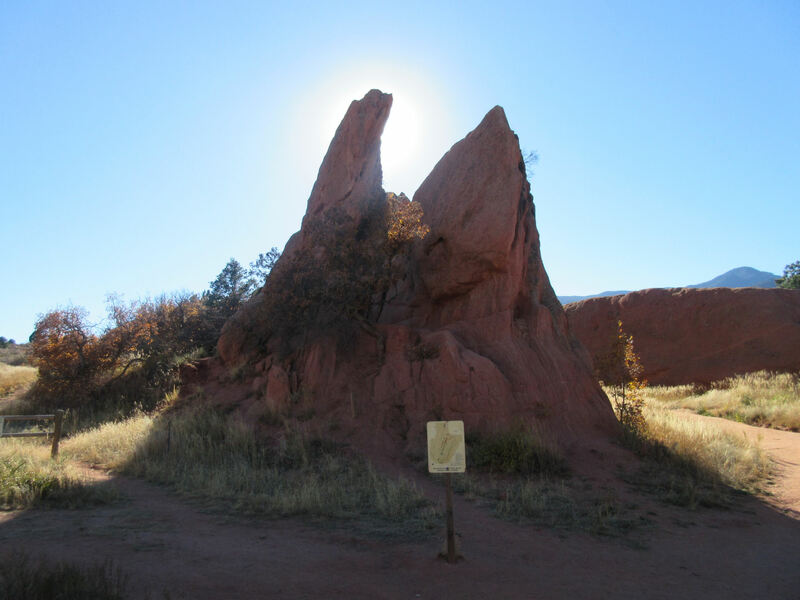 Overall impression: if you’re into creative stone formations, the red Red Rock rocks rock. 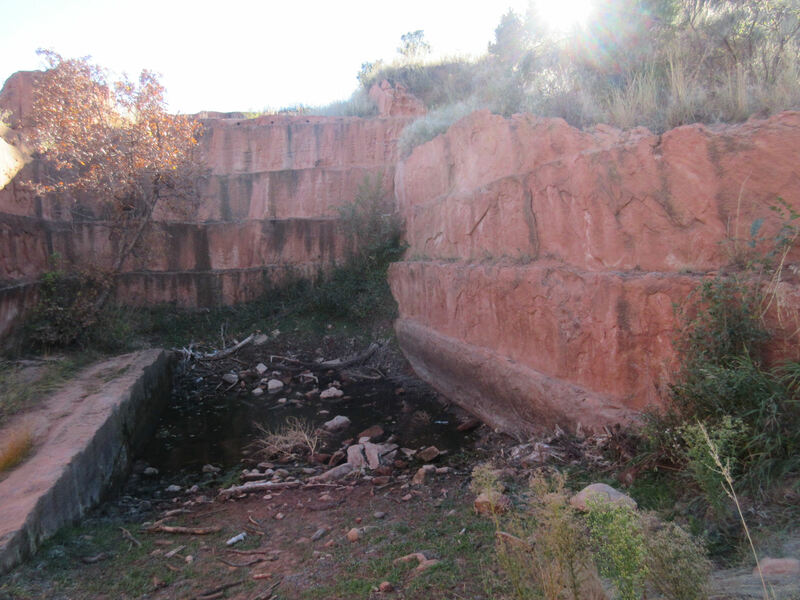 With a little forceful carving and demolition, you could turn this incline into an ideal filming spot for your own remake of the original Star Trek episode “Arena”. Just remember to keep it 100% non-profit. 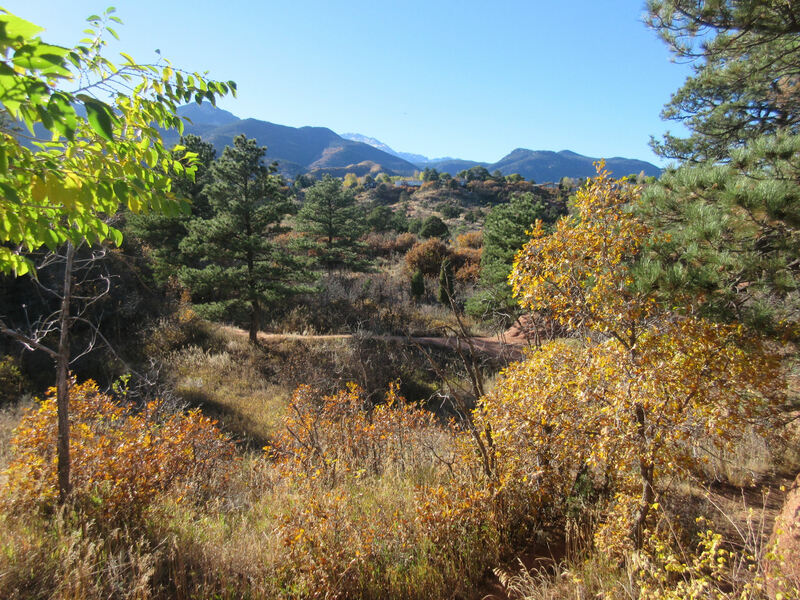 If you ignore the hibernating grass and keep your eyes up and forward, it’s easier to focus on the autumn colors dotting the landscape around you. 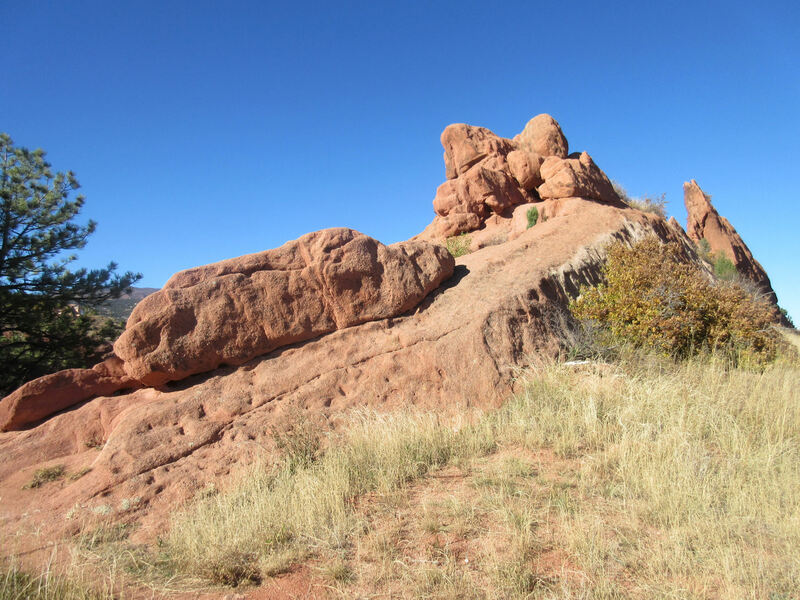 As you climb higher into Red Rock Canyon, your view steadily improves and you can see more of the miles’ worth of civilization surrounding you. 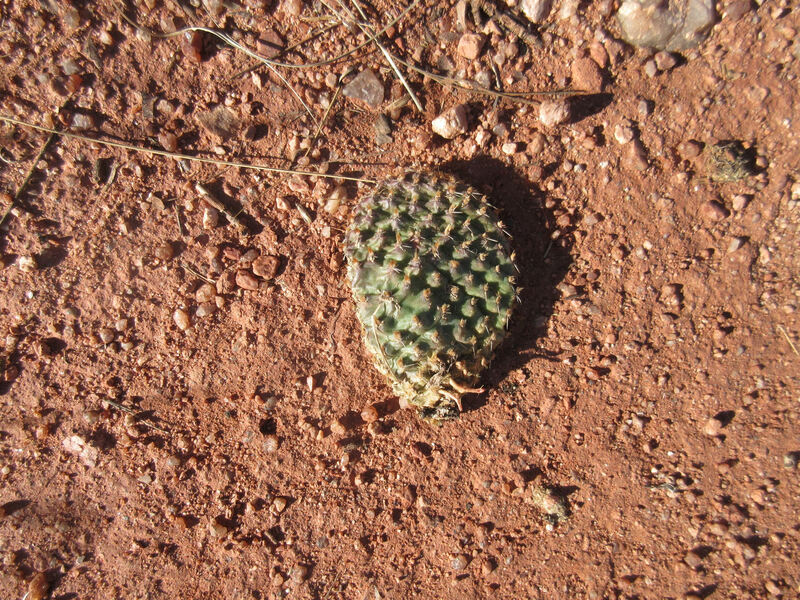 I saw zero cacti on any of the trails I walked, but I found a lone cactus leaf lying on the ground and dying from attention starvation. Either this came from one of the harsher hiking paths, or it fell out of someone’s salad. A few parts were admittedly less photogenic and less naturally re-sculpted than others. 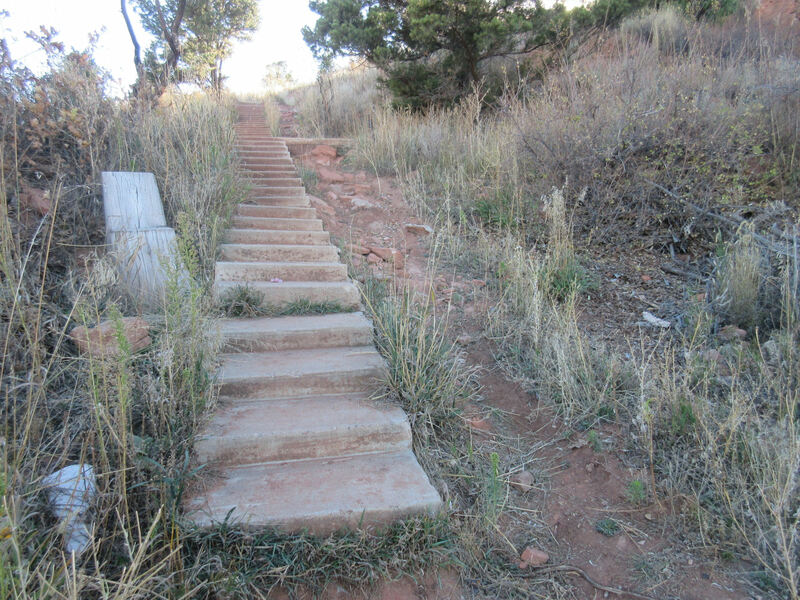 Some inclines slowed me down, but I steered clear of the more rugged trails. 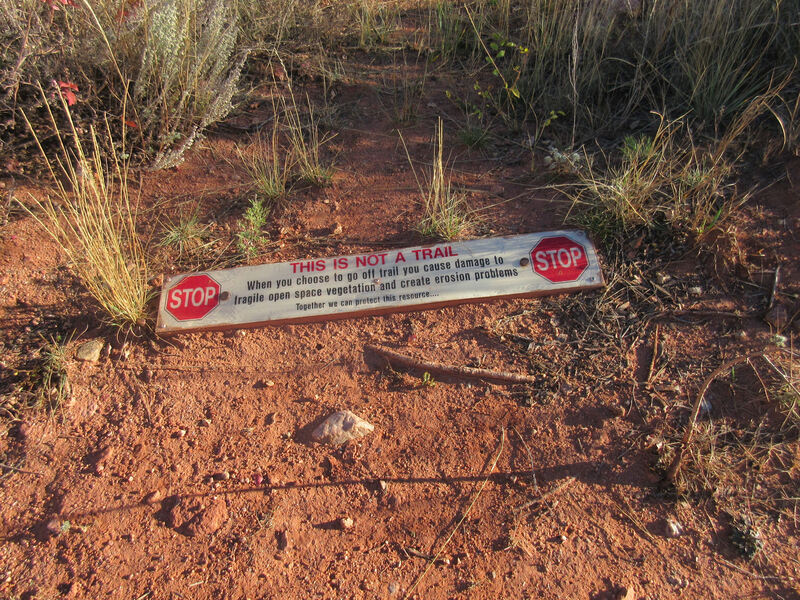 Thankfully their maps are detailed and posted at nearly every trail intersection so you can get your bearings. 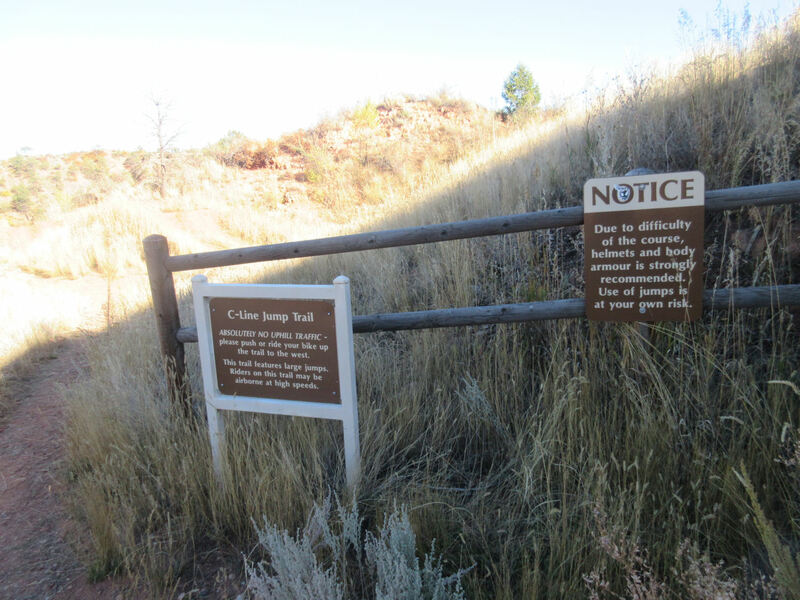 Red Rock Canyon Open Space has signs virtually everywhere telling you what’s what. 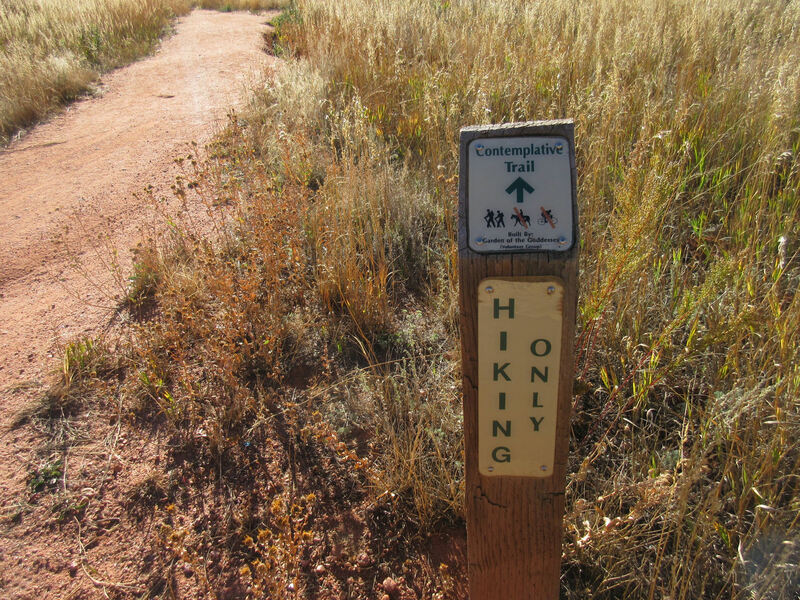 Many areas are fit for walkers, joggers, runners, hikers, bicyclists, and pet owners. A few are declared No Bikes, No Horses, No Dogs. 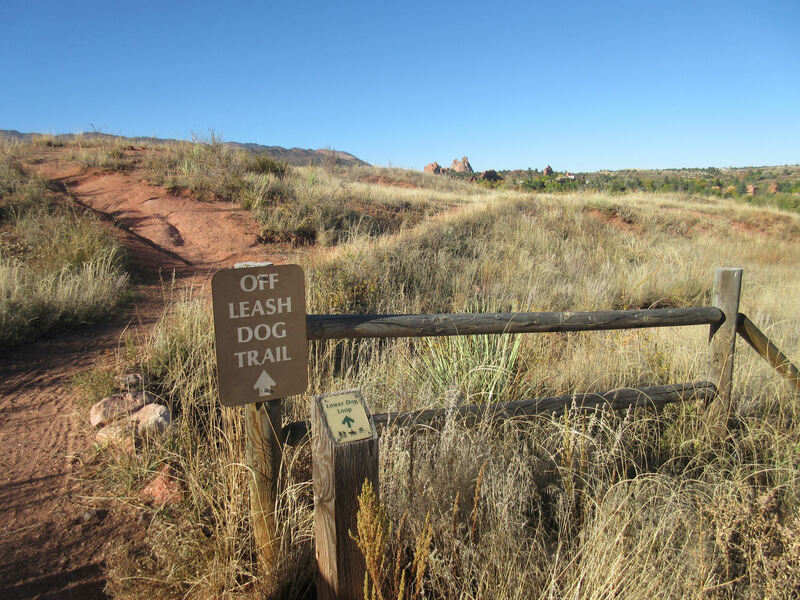 In a couple of designated areas, dogs are permitted to go free and run as wild as their owners can handle. I found one zone with a series of sharp Excitebike mounds where extreme BMX pros can stunt-ride as wild as their parents can handle. Running about willy-nilly wherever you please is strictly forbidden. This wide open space has a lovely natural look, but it’s also very organized and they’d like to keep the “natural” aspects intact. I, uh, think this one is super-secret code for “Local Cabals Only Beyond This Point”. Also, NO DRONES. THIS MEANS YOU. After 50-odd minutes and two fun-filled miles by way of National Geographic, I’d run out of water and was sufficiently walked out for the day. I was curious to know where this mysterious stairway led, but my exploratory resources were all tapped out. Alas, the world may never know. Maybe up there is the cactus garden. Or a cute baby Sarlacc. Or some vending machines. Before descending back to parking level, I surveyed the surroundings, took many more photos for my wife to see later, and noticed off near the northern horizon stood a set of old friends, The Garden of the Gods, which we saw on our 2012 road trip. That’s them in the upper-right corner, much larger if you click. Three years later: still gardeny; still godly. …and then I promptly dragged myself back to the car, swallowed most of another bottled water whole, declared myself done sightseeing and exercising for the day, and drove back to the hotel for some recuperation before my cute tiny wife got off work. Comparing notes between my physical exertion and her psychological stress made for interesting evening conversation.